"The U.S. economy may be teetering on the brink of recession. But there's a bountiful harvest down on the farm," Julie Jargon of The Wall Street Journal writes from Albion, Neb. "Grain prices are surging to historic levels," Jargon notes. "Spring wheat, a variety often used in bread, hit a record $18.53 per bushel yesterday." Some spot-market trading in wheat this went over $20 a bushel, a level never seen before. Corn and soybeans are also "25 percent or more above their year-ago prices," Jargon reports. "While the boom is reversing decades of decline in U.S. rural areas at an otherwise vulnerable time, it's also pushing global food costs higher. ... Here in Albion, a central Nebraska farm town of fewer than 2,000, such problems seem worlds away. People are building new, outsized homes or renovating existing ones. A new ethanol plant has created 55 jobs and a full-time dentist is on the way. A fine-jewelry store moved here in November and a coffee shop run by farmers' wives -- charging Starbucks prices in a town where coffee used to come in a Styrofoam cup -- just celebrated its first anniversary." "Poultry processors face few consequences when they ignore hazards that can kill and injure workers. Weak enforcement, minimal fines and dwindling inspections have allowed companies to operate largely unchecked," The Charlotte Observer reports in the main runner of a six-day series that is worth reading -- especially if you are a journalist in an area with a poultry processing plant. Ames Alexander, Kerry Hall, Ted Mellink and Franco Ordoñez write of their work, "An Observer investigation found workplace safety inspections at poultry plants have dropped to their lowest point in 15 years. The industry has kept steady employment over that time and has leaned heavily on illegal immigrants to fill jobs." The team also found that "Fines for serious violations -- including conditions that could cause deaths and disabling injuries -- are usually cut by more than half, to an average of about $1,100. It has been a decade since OSHA fined a poultry processor for hazards likely to cause carpal tunnel syndrome, tendinitis and other musculoskeletal disorders (MSDs) that are common to the industry. The federal government has made it easier for companies to hide those MSDs. Regulators in 2002 stopped requiring companies to identify injuries associated with repetitive trauma." The other side? "Officials with the U.S. Occupational Safety and Health Administration say poultry plants are safer than ever, pointing to a decade of declining rates of reported injuries. They credit enforcement programs and a growing recognition among industry leaders that reducing injuries is good for business. But the Observer found that the official injury statistics aren't accurate and that the industry is more dangerous than its reports to regulators suggest. Current and former OSHA officials say the agency has made it easier for companies to hide injuries, and has all but abandoned its mission to protect workers." Negotiations on the Farm Bill "teetered at a make-or-break stage" as Congress came home for the Presidents' Day week recess, reports David Rogers of Politico.com. "House Democrats and Republicans joined forces to press the Senate to scale back its demands or risk a historic disruption of the current commodity programs next month." The Agriculture Department called the plan brokered by Agriculture Committee Chairman Collin Peterson, D-Minn., "great work." But Rogers reports that "a top farm-state Senate Republican" said it should be "thrown in the trash barrel." Rogers didn't name the senator, but it could well have been Charles Grassley of Iowa, who said in an interview on WHO's "The Big Show" with Ken Root and Mark Pearson that the House plan was "ridiculous" and "couldn't get 15 votes" in the Senate. Dien Judge writes in the Iowa Independent that "Grassley, known as a jovial and affable fellow, was audibly agitated." Judge also notes that "A wide variety of agriculture organizations, from the conservative American Farm Bureau Federation to the progressive National Farmers Union, have come together to criticize the House proposal. A total of 42 organizations joined together to sign a letter Thursday to House and Senate agriculture leaders in a call to restore cuts to commodity programs." Rogers, a veteran Washington reporter, writes that "House and Senate divisions are mirrored by splits in the Bush administration itself, and the impasse is a growing embarrassment for all parties going into the fall elections. 'We have to get this damn thing done,' said Sen. Jon Tester, D-Mont., one of the few real farmers in Congress." Rogers's analysis is an excellent guide to the politics of the bill. 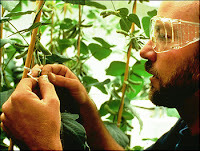 For the substance, we turn to Mike Smith of the Council of State Governments: He reports that most of the savings in the House version "would come from changes made to commodity programs; specifically, the proposal would eliminate direct payments to farmers during the ninth year (2016) of the bill’s 10-year projection. According to the proposal, this move alone would reduce spending levels by approximately $5.2 billion." Smith says the House plan also includes "a hard cap on farm payments by making those farmers whose adjusted gross income is more than $900,000 ineligible to receive farm program payments. Those individuals earning less than two-thirds of their AGI from farm-related income would be ineligible to receive farm payments if their AGI is greater than $500,000 for 2009, $450,000 for 2010, $400,000 for 2011, $350,000 for 2012, and $300,000 for 2013 and every year thereafter. The proposal would also provide a combined $9 billion over 10 years for nutrition programs, down from the $11 billion provided in the House-passed farm bill. Georgia, withering from drought, wants to correct a 190-year-old mistake and move its border with Tennessee a mile north so it can freely draw water from Nickajack Lake. 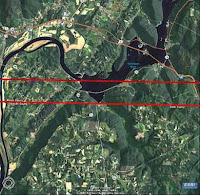 A Georgia legislative committee approved a bill this week calling for creation of a boundary line commission, but officials in Tennessee scoffed at the idea, reports the Chattanooga Times Free Press: "They have criticized the effort as a veiled attempt by a thirsty Atlanta, unwilling to control reckless sprawl, to get access to the bountiful Tennessee River," which the Tennessee Valley Authority impounded to create the lake in the 1930s. Atlanta's situation became more dire this month, with a federal appeals-court decision "curtailing Georgia's access to Lake Lanier – metro Atlanta's primary water source — in the future," wrote Dan Chapman of the Atlanta Journal-Constitution. The suit was filed by interests downstream on the Chattahoochee River, as far as Florida. The border between Georgia and Tennessee is supposed to be 35 degrees north latitude, the horizontal gray line on this Encarta map, centered on the aptly named (from Georgia's viewpoint) community of New Hope, Tenn. The shallows of Nickajack Lake are tantalizingly close to the northern border of Georgia -- about 150 feet, by our reckoning of a satellite photo. A major water intake would probably require deeper water, but no more than 1,000 feet north of the border. The Journal- Constitution used this satellite photo and red lines to show its somewhat different concept of the current and proposed border. Seems to us there are other ways to solve the problem than moving a long-established border. In another story, Chapman said a 2004 TVA study found "Metro Atlanta could receive 264 million gallons a day — triple the average amount used daily by the city of Atlanta last December — with minimal impact on the river." C. Bart Crattie, a surveyor who lives on the Georgia part of Lookout Mountain, told Pam Sohn of the Times Free Press that most of Tennessee's borders were incorrectly drawn to the state's advantage. “Tennessee made out like a bandit on all of its surveys,” he said. 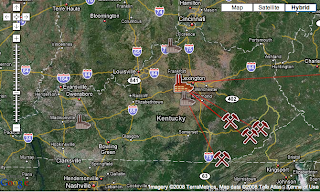 “On the Kentucky line, it’s off in some places by as much as 9 miles in Tennessee’s favor.” (Read more) The two states settled that error in the 1830s by allowing Kentucky to make land grants in the slice of Tennessee that should have been in Kentucky. The bill to offer state loans to start a horse slaughterhouse in South Dakota may not have been to the legislative abattoir after all. Its sponsor tells the Rapid City Journal that support for it is growing, and the Journal's Bill Harlan reports that a committee rejected it "mainly for procedural reasons" after a lobbying campaign from the Animal Welfare Institute. Sen. Frank Kloucek, D-Scotland, "proposed the bill because the last two horse-processing plants in the United States –- in Texas and Illinois –- were closed by state laws. A bill in Congress would institute a nationwide ban," Harlan reports. "In the meantime, Kloucek said, hundreds of thousands of unwanted horses are languishing, either at taxpayers’ expense, or at the owners’ expense. And some horses are simply abandoned." Harlan reports Kloucek might try "a legislative maneuver to force another committee vote, then the vote of the full Senate," and if that fails he "will ask the Legislature’s Executive Board for a summer study." “It’s appalling that we don’t have horse harvesting in the United States,” Kloucek told Harlan, who writes, "He also pointed out that the Midwestern Legislative Conference of the Council of State Governments passed a resolution last year, unanimously, encouraging Congress to support new horse-processing plants." Al Gore used some salty language from his rural roots this week in warning "Wall Street leaders and institutional investors ... to ditch businesses too reliant on carbon- intensive energy — or prepare for huge losses down the road," reports The Associated Press. The former vice president "compared the financial risks facing investors in carbon-using industries with the meltdown in the market for subprime mortgages given to people with blemished credit records or low incomes," John Heilprin writes. 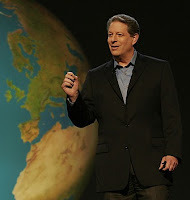 Gore said, "You need to really scrub your investment portfolios, because I guarantee you — as my longtime good redneck friends in Tennessee say, I guarandamntee you — that if you really take a fine-tooth comb and go through your portfolios, many of you are going to find them chock-full of subprime carbon assets." Last Call of National Journal's Hotline said Gore was "losing us at 'guarandamntee,' but still scaring us." Hmph. Guess there's no one at The Hotline from the Highland Rim of Tennessee and Kentucky, where Gore and I grew up. "Guaran-damn-tee," best hyphenated in print for clarity, is a common phrase -- and a good one, if used selectively. Just wish he hadn't said "redneck." Like the rest of the country, Maryland has seen the number of foreclosures continue to rise. In January, the state's Democratic governor, Martin O'Malley, proposed a homeownership preservation package to address the issue, but parts of his initiative have drawn opposition, including one that would cut back on foreclosure public-notice ads. Such legal advertising is especially important to rural weekly newspapers. The oral-health problems of Kentucky and West Virginia have drawn plenty of attention (such as here from The New York Times), and recently the two states have proposed legislation to change their poor records by addressing children's health. This week, the Kentucky House passed a bill that "would require students to get their teeth examined before starting school," reports Sarah Vos of the Lexington Herald-Leader. The legislation, House Bill 186, passed the committee 13-1. Its sponsor, Rep. Tom Burch, D-Louisville, told Vos it should pass the House but could face trouble in the Republican- controlled Senate, where Burch bills rarely fare well. The bill, which would go into effect in 2011, has the support of the Kentucky Dental Association. The Kentucky Association of School Administrators has questioned whether the bill could keep more children going to school. Author Rudy Abramson, a co-founder of the Institute for Rural Journalism and Community Issues and chair of our national Advisory Board, died Wednesday after suffering massive head injuries in a fall at his home in Reston, Va. He was 70. Rudy was our good friend and close adviser. He came up with the idea for the Institute after retiring from the Washington Bureau of the Los Angeles Times and continuing reporting in Appalachia, where he saw the need for an organization to help rural journalists cover the big issues facing their communities, especially those driven by faraway players such as coal companies and federal politicians. 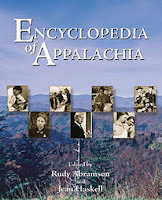 Rudy told our friend Howard Berkes of National Public Radio in a 2006 interview about the encyclopedia that the word "hillbilly" first appeared "in the New York Sun about 1900 and the definition of it was a white person from Alabama without visible means of support, ambition or much of anything else. And I suppose that was one of the reasons that I got involved in this project. It seems that I'm the absolute hillbilly by that definition." That quote was in The Washington Post's obituary of Rudy, by Adam Bernstein. Rudy Paulk Abramson is survived by his wife, Joyce; daughters Kristin and Karin; and three grandchildren. Cremation was chosen. A memorial service is scheduled for 11 a.m. Tuesday, Feb. 26 at the Freedom Forum's new Newseum at 555 Pennsylvania Ave. in Washington. The family asks that memorial gifts be made to the Institute for Rural Journalism and Community Issues, 122 Grehan Bldg., University of Kentucky, Lexington KY 40506-0042, or the New Opportunity School at Berea College. Rudy was a native of Florence, Ala., and a graduate of the University of Mississippi. He was a political reporter at The Tennessean in Nashville before joining the Times in 1965. He covered the space program, the White House, the Pentagon, arms control and the environment, among other topics. He was White House correspondent when Richard Nixon resigned the presidency in 1974. An expanded version of this item appears on the Institute's home page. Kentucky would have up to 12 casinos, some in rural areas, under legislation proposed today by Gov. Steve Beshear. The plan is being pushed by the state's influential horse interests, mainly racetracks being hurt by competition from casinos in adjoining states, most recently West Virginia. Fleshing out his major platform plank of last year's campaign, Beshear proposed a constitutional amendment to allow seven track-operated casinos in counties with tracks and five elsewhere, and enabling legislation specifying the eligible counties. Two tracks are, by definition, in rural areas -- Franklin and Prestonsburg. Another, at Paducah, population 30,000, is also outside a metropolitan area. Tracks "could build off-site in their county ... subject to the approval of a local legislative body," writes Greg Hall of The Courier-Journal (which produced the map). One non-track casino would be allowed in either Laurel or Whitley counties, on Interstate 75 in southeastern Kentucky, a rural area. All other sites would be in metropolitan areas, though in some cases they might involve counties with many rural residents -- such as Christian in southwestern Kentucky and Greenup at the state's northeast corner. The reaction from rural areas was not favorable, reports The C-J's Joseph Gerth. A countywide referendum would be needed to approve a non-racetrack casino, which could prevent approval of one in socially conservative southeastern Kentucky. Passage of constitutional amendments in Kentucky requires a three-fifths vote of both the House and Senate, and majority approval of voters in a statewide referendum. Prospects for the Democratic governor's proposal are dicey, to say the least (pun intended). Leaders of the Republican-controlled Senate oppose it, despite a state budget crisis that has left the state with less money to spend in each of the next two fiscal years than the legislature appropriated for the current year. Whitley is the largest and easternmost county in the district of Senate President David Williams of Burkesville, who predicted that the plan would not even pass the Democratic-controlled House. Last Valentine's Day, The Rural Blog mentioned an online dating service aimed at rural singles in the United States and Canada called FarmersOnly.com. Back then, the site was a year old and had grown to more than 50,000 users. It now boasts 85,000 users, and this year The Associated Press picked up on the story. "Playing the dating game isn't easy in rural America: Tens of thousands of twentysomethings have moved out in recent decades, small towns have shrunk, younger farmers have become a dwindling commodity," Sarah Cohen writes. "Or to put it another way ... there's a lot of land and not that many people." That's where FarmersOnly.com comes in, which has led to more than 40 marriages since being founded by Ohio publicist Jerry Miller in late 2005. For $30, someone can post a profile and photo for three months. Cohen relates the stories of three different couples that met on the site, including that of Sonya Rinker and Tom Henisee (above in an AP photo by Carolyn Kaster) who live in rural Pennsylvania and now are engaged. One report claimed, "The widening adoption of genetically engineered crops by farmers around the world is reducing global pesticide use, increasing agricultural yields and bringing unprecedented prosperity and food security to millions of the world's poorest citizens," Weiss writes. The other said genetic engineering "is fueling greater use of pesticides, putting crop yields at risk, driving small farmers out of business and decreasing global food security by giving a single company control over much of the world's seed supply." The two reports were released yesterday, one funded by the biotech industry and the other by environmental and consumer groups. You can probably guess which one is which. "More than 280 million acres of them were planted in 23 countries last year, a 12 percent growth in acreage and an increase of two countries compared with 2006," Weiss writes, noting that the two studies interpret these stats differently. When the transition to digital television broadcasting goes into effect in about a year, there could be some confusion for viewers in rural areas who depend on low-power stations and translators, or signal-relay stations. The transition is required for full-power stations, but not these smaller broadcasters, so the Federal Communications Commission wants to make sure rural viewers stay tuned, reports John Dunbar of The Associated Press. "The government is spending $1.5 billion to provide people with older-model televisions that use rabbit ears or other over-the-air antennas with special digital-to-analog converter boxes," Dunbar writes. "That solution helps full-power stations, but creates confusion for viewers of low-power stations. People who buy the wrong box might actually end up blocking their favorite local channel without knowing it." After graduating from Fisk University in Nashville, Tashuna Davis (left) assumed she would find her first job "in the big city." Instead, she returned to her hometown of Bogalusa in rural southeastern Louisiana — a choice she explains was the right one, in an essay for the Daily Yonder. While no job appeared in Nashville, "I did get a job offer in my hometown, to work at Service Zone Inc.," she writes. "I got the call exactly one day after my graduation. This company handled technical support calls for Gateway computers, which was wonderful for me, being that my major was computer science. I was close to my field of study, I thought to myself. This disproved my claim that finding gainful employment in a rural area was impossible." Upon returning home, she faced questions about her choice to come back. In this essay, she offers her answers: "Since I was busy at work, I forgot about my promise never to return to rural America again. I fell in love again with being able to leave the house and car doors unlocked, driving and not seeing another car for miles . . . I had forgotten what it was like to look into the sky and see the stars and moon clearly with no interference." The group announced yesterday that "it opposes the massive gold and copper Pebble Mine planned for Alaska's Bristol Bay watershed," Roosevelt writes. "The jewelers' 'Bristol Bay Protection Pledge' marks a new front in the 'No Dirty Gold' initiative waged by environmental and human rights groups against destructive mining practices." To date 28 companies have endorsed the campaign's "Golden Rules" about protecting ecosystems. The supporters include the 10 largest jewelry retailers as well as Wal-Mart Stores Inc. Wal-Mart is considering joining the protection pledge as well. "An estimated 80 percent of the gold used in the U.S. is for jewelry," Roosevelt writes. "And gold mines -- typically huge open pit operations where tiny veins of metal are ground from millions of tons of rock -- produce an average of 76 tons of waste per ounce of gold." In the past, jewelry retailers had lobbied for mining regulations; this is the first time that they have come out against a specific mine. The proposed Pebble Mine is a partnership of Vancouver, Canada-based Northern Dynasty and London-based Anglo American. "Pebble is controversial due to its massive size and its location at the headwaters of two of the five major river drainages that feed Bristol Bay's world-class salmon fisheries," reports Elizabeth Bluemink in the Anchorage Daily News. "If developed, it could be the largest gold-copper mine in the world, providing hundreds of jobs in a region where jobs are scarce, according to the mining companies involved. However, the companies have not yet finished exploring the deposit, north of Iliamna, and they haven't submitted any plans to state officials to develop a mine." With a month left to pass the legislation, members of the House Agriculture Committee "proposed the outline of a farm bill that they said could meet the Bush administration’s spending limits," reports Philip Brasher of the Des Moines Register. The Farm Bill is an enormous piece of legislation that has withstood several attempts at major reform. In an essay for the Daily Yonder, Richard Oswald identifies the "headaches" the bill gives farmers and consumers and explains them: "Don’t get me wrong, I appreciate all the hard work Congress does on these things. It’s not easy building a coalition of cooperation among all the special interests. Livestock growers want abundant grain supplies. Grain growers want abundant prices. Grain dealers want abundant markets. And taxpayers want abundant food at low cost. Hence we have a farm bill and abundant headaches." After three years, Smithfield Foods has sold its biofuel plant, because the main ingredient — pig manure — did not have enough nutrients to make process profitable, reports Janie Gabbett for Meatinplace.com. "The goal of Smithfield BioEnergy was to capture methane from manure provided by Smithfield's Circle Four Farms swine production operation near Milford, Utah, convert the methane into bio-methanol, and then convert that — along with animal and vegetable fats — into bio-diesel fuel," Gabbett writes. Initial estimates based on government data assumed the manure's nutrient content would be strong enough, but in actuality, the "animal manure produced on Smithfield's farms proved to be more than 50 percent below published data estimates," Gabbett writes. The company attributed the levels to animal genetic improvement, improved feed conversion, reduced water volume used in production systems and precisely formulated animal diets. Last week, we mentioned that three major investment banks — Citigroup, J.P. Morgan and Morgan Stanley — had tied carbon-dioxide emissions standards to their financing of coal-fired power plants, anticipating the first federal limits on CO2. Bank of America has become the latest lender to show it is bracing for a cap on emissions, reports Environmental Capital, a blog of The Wall Street Journal. "Bank of America says it has decided to start factoring a cost of carbon-dioxide emissions into its decisions about whether to underwrite debt for new coal-fired plants," Jeffrey Ball writes. "Specifically, the bank says it anticipates a federal cap that would require a utility to pay between $20 and $40 for every ton of CO2 its power plants emit. Today in Europe, which already has imposed caps, a permit to emit a ton of CO2 is trading at about $29." Grim reports about the financial struggles and the uncertain future of newspapers get plenty of play in media outlets. (We mentioned one recent story in The New York Times.) Amid this doom and gloom, however, smaller and community newspapers are doing well, reports Jennifer Saba and Mark Fitzgerald of Editor & Publisher. Their report appears in this month's issue of E&P, but the Saba discusses the "small is beautiful phenomenon" in a podcast on the magazine's Web site. She says most industry analysts focus on the top 100 daily newspapers and ignore the 8,000 non-dailies. These papers are posting double-digit profit margins and seeing big increases in advertising and circulation, things "that are unheard of for a lot of these big metros today," Baba said. Hodgenville, Ky., the birthplace of Abraham Lincoln, spent lots of time and money preparing for this week's kick-off to the two-year National Lincoln Bicentennial celebration of the president's birth. Tuesday's wintry mix of snow, freezing rain and ice spoiled Lincoln's 199th birthday by forcing cancellation of events to be attended by First Lady Laura Bush, Interior Secretary Dirk Kempthorne, actor Sam Wasterson and "thousands of Lincoln lovers," reports Chris Kenning for The Courier-Journal in Louisville, about an hour north of Hodgenville. (Lincoln look-alike Mike Cox of Antioch, Tenn., walked through Hodgenville in a C-J photo by Pam Spaulding.) Click here to read more and watch videos. The town of 2,800 had spent the past two years working with the National Park Service to orchestrate the morning festivities that were to be the official start of the two-year celebration of Lincoln around the country. The cancellation left thousands of unused programs and plenty of disappointment, but the LaRue County Herald News, the local 5,000-circulation weekly, tried to accentuate the positive with its report headlined, "Community rebounds after Lincoln Bicentennial kickoff program canceled at Abe's birthplace." “Certainly, this was one event our community wanted to see happen,” County Judge-Executive Tommy Turner, a member of the national and state commissions for the celebration, told the paper, adding that he was "heartbroken" by the cancellation. Sandy Brue, chief of interpretation and resource management for the Abraham Lincoln Birthplace National Historic Site, told the paper, "“It’s more like a funeral” with all the unused programs and wasted food lying around. Still, this was not the bicentennial, Turner told the paper. He added that next year holds the promise of another ceremony, albeit one that will be held indoors instead. (Read more) Turner, a loyal Democrat, may be hoping for a visit from a President Barack Obama, who likes to note his Lincoln connections. The daily paper nearest Hodgenville, The News-Enterprise in Elizabethtown, titled its report "Lincoln letdown," in which reporter John Friedlein described the local events that did go on as planned, despite the reduced crowds and bad weather. (Read more) For a nice story by our friend Judy Jones Owens in the Daily Yonder, about Lincoln impersonators (they call themselves "Lincoln presenters"), click here. Kennedy guides readers to a Web site (in image) that uses Google technology and satellite photographs to pinpoint coal mines from above. "If the American people could see what I have seen from the air and ground during my many trips to the coalfields of Kentucky and West Virginia: leveled mountains, devastated communities, wrecked economies and ruined lives, there would be a revolution in this country," Kennedy writes. "Thanks to Google Earth, you can now visit coal country without ever having to leave your home." The site is impressive, showing how coal mined in Appalachia is used to power faraway places, but the satellite images can be misleading; not all the disturbed areas (lighter areas amid the green of Appalachia's forests) are mountaintop-removal mines. Some are area mines that reclaim land to its approximate original contour, as generally required by the 1977 federal strip-mine law. Mountaintop- removal mines operate under a steep-slope exemption to that law. Hillary Clinton carried the mostly rural, western end of Virginia but lost other rural areas of the state to Barack Obama in yesterday's premier presidential primary. Obama won 60 percent of the vote in the precincts that the National Election Pool exit poll classified as rural; those accounted for 18 percent of the statewide sample. He got the same percentage in suburbs, which accounted for just over half the sample, and 66 percent of the vote in cities. Clinton had hoped to rack up a large margin in southwest Virginia, and she did, getting about 60 percent of its vote (90 percent in Buchanan County, where Virginia, West Virginia and Kentucky meet and the population is 2.6 percent black), but the region made up only 13 percent of the statewide total, according to the exit poll. The region is heavily white and Protestant; statewide, Clinton carried white Protestants 53 to 47. She and Obama tied among white Catholics. Among all whites, Clinton won 50-49, well within the poll's margin of error. Whites accounted for 61 percent of the vote, African Americans 30 percent. Obama carried the black vote 88-12, making it the key to his 64 percent overall. But despite all the talk about race, gender may have played a large role, too. Among the 14 percent of voters who said the country is not ready to elect a black president, Clinton won 64-34, but among the 16 percent who said the country isn't ready to elect a woman president, Obama had a much wider margin, 81-16. Other exit-poll signs of Obama's strength: Clinton carried white women by only 10 points, and tied with Obama among voters over 65. In the state's open primary, 7 percent of the Democratic vote came from Republicans, and they went 71-25 for Obama, recently rated last year's most liberal senator by the nonpartisan, authoritative National Journal. Nevertheless, Obama did better among self-identified conservatives than among liberals. One of Clinton's few advantages was among the 22 percent of voters who said experience is the main thing they are looking for in a presidential candidate; she won 94 percent of their votes. Among the 56 percent who said their priority was change, Obama won five of every six votes. The exit poll results are striking, and worth a look; Obama won nearly every demographic group, a strong sign that he is gaining momentum as he surpasses Clinton in number of pledged delegates. Similar results in Maryland "raised the possibility that her coalition is beginning to crack," writes Jonathan Weisman of The Washington Post. The debate over a proposal to build a $1.8 billion coal-fired power plant in the coal country of southwest Virginia has escalated. The first of two hearings began yesterday and continued today, and advertisements for and against the proposal have dominated local radio and newspapers and appeared on billboards along the region's main highway artery, reports Kathy Still of the Bristol Herald Courier. "These days, newspaper readers often find full-page advertisements from Dominion Virginia [Power] touting the plant’s positives, including jobs and tax revenue," Still writes. "And local radio waves are filled with commercials also singing the praises of the controversial project. But those who travel along U.S. Highway 58 between St. Paul and Coeburn can’t help but see a large anti-plant billboard across from the planned site for the Virginia City Hybrid Energy Center, known locally simply as the power plant." His sponsors at RuralVotes having raised enough money to keep him on the job for a few more weeks, Al Giordano is busily churning out posts for his rural-oriented presidential campaign blog, The Field. He's a Democrat who has trended toward Barack Obama and away from Hillary Clinton, but his observations are usually worth considering, especially two today. Giordano contrasts Obama's schedule with a remark Clinton made last night: “We’re never going to carry Alaska, North Dakota, Idaho. It’s just not going to happen.” He notes that North Dakota has two Democratic senators and argues, "To write off so much of the country is to abandon Democrats running for Congress, and will only result in having a less governable situation if one does become president." Then Giordano went after Pennsylvania Gov. Ed Rendell for telling the Pittsburgh Post-Gazette, “You’ve got conservative whites here, and I think there are some whites who are probably not ready to vote for an African-American candidate.” Giordano writes that was "a very clear demonstration of how certain northern liberal Democrats think, both about rural voters, and about someone running for president that happens to be African-American." (For the Post-Gazette column by Tony Norman, click here.) "Rendell’s statement was a bigger insult to rural white Pennsylvanians even than to African-Americans," Giordano writes. "He’s saying, “You hicks are the bigots, and I’m not, but I’m happy to exploit your ignorance.” And on April 22, rural Pennsylvanians will give the governor a lesson in civics." Well, perhaps, if such a lesson can be discerned from election results 11 weeks later. Not all of Pennsylvania's "conservative whites" live in rural areas, but those areas are known for their conservative voting habits. Rendell estimated that if his last Republican opponent, former football star and TV personality Lynn Swann, had been white, his margin over Swann would have been 17 percent instead of 22. Our experience at covering politics tells us that's not a bad estimate, especially from an old pro like Rendell, and national polls still find that 5 percent or so of voters say they won't vote for a black candidate. The actual percentage is probably higher, because most Americans also tell pollsters that many if not most white voters who say they would have no problem voting for a black candidate for presidential candidate actually do have reservations about casting such a vote. But at the same time, we suspect that many Americans of a certain age, who have regretted for years how they first behaved or felt during the civil-rights movement, would welcome a chance to cast a cathartic vote for an African American like Obama, who inspires partly because he offers the chance for final healing of such old wounds. And while Clinton seems to do better among rural voters at large, Obama is doing better among them than some old pros like Ed Rendell probably expected. We think that and other phenomena show that rural racists are gradually becoming marginalized, and are no longer emblematic of rural America. Many newspapers have created sections of their Web sites that solicit and display readers' photographs. The sections help increase Web traffic on the sites, but The Independent in Ashland, Ky., has seen its photo section start to become an artistic showcase. "Although we've received our share of cute pet photos, and I like those, we're getting some visually high-brow submissions as well," chief photographer John Flavell wrote in an e-mail. "What started out as a blatant way to attract readers to interact with the Web site could become a public space for the artistic types in the region." Two of the world's top three leading mining companies are headed toward a merger that "would be but an opening act in a world-wide competition for resources for which there are few precedents," reports Dennis K. Berman of The Wall Street Journal. BHP Billiton has put in a $132 billion unsolicited offer for Rio Tinto, and together the Anglo-Australian companies "would have a firm hand in iron ore, coal and copper, pulled across 154 separate mines from Madagascar to Michigan," Berman writes. That has implications for rural areas, where extractive industries do almost all their extracting. If the offer is accepted, the resulting $350 billion company would only trail Exxon Mobil in size and would have "nearly double the profit of Microsoft and 45 times the profit of Yahoo," Berman writes. "It would create a company so geographically dispersed, and so politically influential that it would become almost a country unto itself." "Secrecy in Mississippi," a collaborative, eight-day series by the state's news organizations to focus attention on the flaws, loopholes and omissions in the state's open-government laws, is now running in weekly newspapers after starting in dailies. "These articles represent an extraordinary effort by reporters and editors who are concerned that the lack of transparency in Mississippi is harmful to the state's well-being," wrote Stan Tiner, executive editor of The Sun Herald in Biloxi, which was among the papers running an overview of the series Sunday. The paper also ran an editorial saying, "Don't wait until a government door is slammed in your face or you are tossed out of a public meeting or you are denied a public document of vital importance to you to become concerned about these issues. The time to concern yourself is now." In addition to the overview, The Clarion-Ledger in Jackson ran a column by David Hampton on the topic. "Until 1975, there were no laws in Mississippi requiring that government meetings be open to the public," he writes. "Public officials routinely closed meetings at every level of government. Tax money could be spent and public policy decided behind closed doors. Officials decided just how open they wanted to be." Yesterday's installment examined high legal costs citizens face when they fight for records and challenge closures of meetings. "In Mississippi, a state with a long history of government secrecy, it can be difficult, expensive, time-consuming -- and sometimes all but impossible -- to know what government leaders are up to and what special interests pull their strings," write The Clarion-Ledger's Emily LeCoz and Geoff Pender. "That's because enforcement of the state's Public Records Act and Open Meetings Act falls not on the shoulders of the state but on those of the public itself." Emergency services are often slower and less dependable in rural areas, and while cell phones should help speed response time, theyadd to the problems for rural residents, reports Sheila Hagar of the Walla Walla Union Bulletin in southwest Washington state. That's because not all counties have systems in place that can deliver a caller's number and address. Hagar offers a heartbreaking sidebar, about a local elderly woman who died after trying to get help by calling 911 on her cell phone. She did not have a land line. Her body was discovered five days later, a delay caused in part because the call was considered "a hang-up" by the 911 center in Pendleton, Ore., about 30 miles south of the woman's home in Milton-Freewater, Ore., about 10 miles south of Walla Walla. One of the coldest winters in years in the Upper Midwest has been especially trying for rural residents who don't have natural-gas service and depend on propane and other "deliverable fuels" to heat their homes. The price of propane has "gone up about 35 percent since last year, nearing $2 per gallon," and that means some residents cannot afford to make the upfront payments required by suppliers, reports The Associated Press. For information on propane and its prices, from the federal Energy Information Administration, click here. To crack down on illegal immigration, several states and cities have passed their own enforcement laws recently. Challengers of those laws won several times in court last year, but more recently, judges in Arizona, Missouri and Oklahoma have upheld such laws, reports Julia Allison of The New York Times. Thieves in rural California have stripped a large, abandoned home of its appliances and fixtures, and authorities say they are seeing more rural homes suffer the same fate as foreclosures and abandonments increase, reports Joe Goldeen of The Stockton Record. Goldeen describes the damage done to the 8,000-square foot Guzman house (in a Record photo by Craig Sanders) in Stockton, but the destruction is not isolated to this incident. "While abandoned rural homes have always appeared to attract attention from lawbreakers, Environmental Health's Alan Biedermann has seen a sharp increase in problem homes that are damaged like the Guzman house," Goldeen writes. "Many are way beyond repair and must be demolished, he said." In three national parks in Colorado and the Dakotas, the elk population is straining the food supply for other foragers and browsers, so officials are considering shooting elk to restore balance, reports Peter Slevin of The Washington Post. Simply put, the elk (in an Associated Press photo by Sara Gettys) are out-eating other animals such as bison, feral horses and deer. 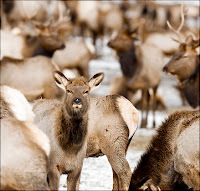 National Park Service "Spokeswoman Kyle Patterson said proposals to curb the elk population at Rocky Mountain have inspired 'strong feelings across the board,'" Slevin writes. "Recommendations ranged from shooting and fencing to contraception and the introduction of wolves, one of elk's few natural predators." Add the venerable St. Petersburg Times to the list of newspapers that have cut their circulation and coverage outside their metropolitan areas -- and to a shorter list of those that have had the guts to allow a ranking employee to bemoan it in print. Two weeks ago, the paper stopped circulating in the state capital of Tallahassee, and its news bureau there is down to three full-time reporters, plus senior correspondent Lucy Morgan, reports Bureau Chief Steve Bousquet. "That's down from four a year ago (what this bureau chief calls 'a 25 percent cutback' to his bosses)," he writes with just the right hint of indignation. The paper is owned by The Poynter Institute, but is not immune from financial pressures caused by declining print circulation and advertising. Other big Florida papers have cut back, too. After citing chapter and verse, Bousquet writes, "Fewer reporters means more reliance on Associated Press stories, which are serviceable but can't possibly be tailored to regional differences. Fewer reporters mean fewer people to monitor lawmakers and encourage them to pay attention to problems back home." His column is headlined "We're losing a leash on legislators." It's been a rough winter for parts of the Midwest and New England, and those storms have strained local supplies of road salt, reports The New York Times. "With so many municipalities in need of salt, suppliers cannot ship it out quickly enough," Katie Zezima writes. "Public works departments are left waiting for days or weeks to receive their orders." Some Wisconsin municipalities are using beet juice to thaw roads instead of salt, reports The Associated Press. Mike Hoeft of The Green Bay Press-Gazette reports that neighboring Ashwaubenon has stopped spreading salt on secondary roads and that many rural areas will get sand instead of salt. Around Chicago, suburbs are rationing salt, too, making for long commutes into the city on icy roads, reports The Chicago Tribune. The Tribune also notes that deliveries of more salt are being slowed thanks to ice jams stalling salt barges on the Illinois River. Google announced a new feature last week: a local news search on Google News. This feature, which is accessible from the service's main page, allows users to search for stories by zip code or city -- something Topix.net has offered for several years. "While we’re not the first news site to aggregate local news, we’re doing it a bit differently -- we're able to create a local section for any city, state or country in the world and include thousands of sources," explains Google News Blog. "We’re not simply looking at the byline or the source, but instead we analyze every word in every story to understand what location the news is about and where the source is located." It's worth checking out, but it seems the sources are somewhat limited to major newspapers and television station Web sites. (Read more) A few weeks back, we also offered some tips for narrowing searches on Google News. Topix brushed off the development, first giving a little of its history: "We added government, weather and industry sources, and then we added 25,000 blogs to the mix to see what we'd get. And, pretty much, they still didn't provide the breadth of coverage around local news, especially around small towns." Concluding that "there wasn't enough coverage of most areas by the mainstream press or the blogsphere, and that the real opportunity was to become a place for people to publish commentary and stories," Topix started forums. "Two years and 25 million posts later, Topix has gone from being merely an aggregator of local news, to becoming the home of local voice on the Web." "Another five radio advertisers have joined a growing list of companies that have pulled their ads from Michael Savage's national radio show, 'Savage Nation' . . . as a result of a coordinated campaign aimed at Savage's remarks against Muslims and other groups by organizations such as Hate Hurts America Community, and Interfaith Coalition," reports Katy Bachman of MediaWeek. "The five advertisers, ITT Technical Institute, Chattem, Inc. (Gold Bond, Icy Hot and Selsun Blue), Union Bank of California, Intuit (TurboTax and QuickBooks) and GEICO Insurance, dropped the spots after they were contacted by visitors to the Web site http://nosavage.org. The site has audio clips from Savage's radio show as well as printed excerpts. Other advertisers that have pulled spots include Citrix, US Cellular, Sprint Nextel, Sears, Universal Orlando Resorts, AutoZone, JCPenney, OfficeMax, Wal-Mart and AT&T," Bachman reports. A West Virginia legislator filed a bill last week that "would essentially outlaw mountaintop-removal mining," reports Scott Finn of West Virginia Public Broadcasting. Sen. Jon Hunter (D-Monongalia County) called for a public hearing, and as acting chairman of the Energy and Mining Committee, could put the bill on the docket. But he acknowledged that it has little chance of passing because the state is addicted to the tax revenue the practice generates. “I introduced Senate Bill 588 because I fervently believe that God did not intend for us to destroy the mountains, the streams, the forests and His people in order to mine coal,” Hunter said, also citing polls showing that about 60 percent of West Virginians favor a ban on mountaintop removal. The bill would eliminate the valley fills that result from, and are economically required by, mountaintop removal. About two dozen landowners and other activists came to the Capitol to support Hunter's bill, reports The Herald-Dispatch in Huntington. (Read more) Acivists generally agree that action at the federal level is more likely than in the four states where mountaintops are being mined for coal. West Virginia and Kentucky rely on the industry, and in Virginia and Tennessee, the practice has relatively minor impact. For our report on that, from last summer, click here. Jim Bruggers, environmental writer for The Courier-Journal, informs Louisville-region readers about a big case involving mountaintop- removal strip mining for coal in Leslie County in Eastern Kentucky: "The Thunder Ridge mine is undergoing a planned 1.5-square-mile expansion that, since December, has become the newest front line in a national battle over mountaintop removal and other surface mining methods. The Kentucky Waterways Alliance and the Sierra Club have had recent success using the courts to slow the Thunder Ridge expansion." The environmental groups sued the U.S. Army Corps of Engineers, which issues water-pollution permits. The suit says that the corps' Louisville office "allowed streams to be filled in five valleys, and [that] a mitigation plan is flawed. After work on the first two began in December, the corps in January blocked the three others, agreeing to take a second look. It was the first time the Louisville office had done that." Most such permits for mountaintop-removal mines are handled by the Huntington, W.Va., office; the boundaries are based on watersheds.